Do you have an ‘angry personality’? Is there such a thing as an “angry personality”? The bad news is that there are people who are more “threat sensitive” than others; their personality and genetic make-up (as well as learned experiences throughout their lives) make them more likely to get angry without needing much provocation. Some symptoms of mood disorders include irrational anger and sometimes people suffering depression, experience a lot of anger. Depression is often anger turned in and we are totally unaware of this. I call it ‘frozen rage’ as it sits in our chest with no respite, except when we use alcohol or drugs to relieve the emotional pain. The good news that this personality trait or depressive trait can be changed and angry people can become much calmer by using some supplements, cognitive therapy and Mindfulness. Some people require heavier medication like a mood disorder prescription if they have been diagnosed with Bi Polar or Borderline Personality or some other mood or personality disorder. Some people suffering with chronic depression do need an anti-depressant to help them recover. In the meantime, they too, can find relief through cognitive therapy and Mindfulness. We all have different responses to anger. The difficulty is that we can rarely deal with our anger by the physical means available to our less civilised ancestors; today, dealing with anger is far more complex and has to obey the rules of our society. We can’t go around knocking people out whenever we become irritated, frustrated and angry. Anger is expressed in a faster heart beat and raised blood pressure when we use up our adrenaline supply. We also lose energy as anger affects our cortisol levels so it pays to be able to harness or rein in your temper or angry outbursts. You’ll live longer and be happier once you treat your anger. 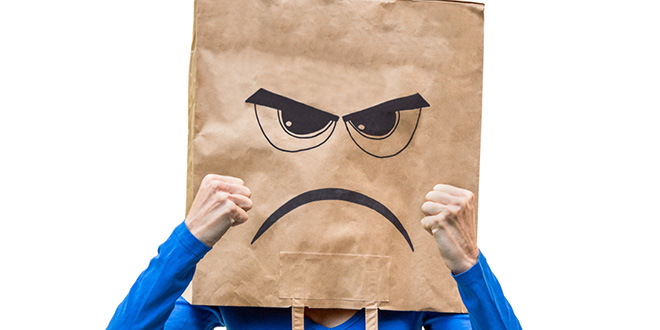 Whilst most of us know what anger is, many of us confuse it with aggression and frustration. I get frustrated and, if I let my frustrations take over, I end up irritable and cranky. It is an idea to separate these terms to help understand them and their relationship to anger. Frustration is often a precursor to anger. It is the feeling we experience when we don’t get what we want. It took me a while to understand that philosophy because I thought of myself as being a caring and sharing type of person and did not equate myself as being selfish or self-centered – but I was. Time has taught me a lot and I will pass on to you, over the next few weeks, how I harnessed my own tantrums and turned them around. When obstacles are put in our way or when someone interferes with our attempts at achieving our goals, we get mad, sad or do something bad. At work, telephone interruptions, colleagues popping by for a chat, the computer server being slow and that woman you can’t stand, has been talking about you behind your back, are all types of frustrations that can easily build to create work place anger. Aggression, on the other hand, is the action that can result from the feeling of being angry. It is usually intended to cause physical or emotional harm to others, perhaps with verbal insults, threats, sarcasm or raised voices. When aggression becomes so extreme that we lose self-control, it is said that we are in a rage. Such a person is characterized by being very loud – shouting and screaming – red in the face, shaking, threatening and perhaps even physically abusive. When we display moments of anger, we are often remorseful afterwards and sometimes feel very guilty. That’s when alcohol, drugs, prescription drugs, over-spending, gambling and other ingested or behavioral addictions, take over and we end up worse off than we were before the experienced the aggression. That’s the difference between a mere frustration and aggression. Suppression and expression of anger at work can have potentially negative outcomes for the individual and for those around them. How does anger affect us? Anger, like stress and other powerful emotions, has a profound effect on the body. As our anger rises, the hypothalamus in the brain stimulates the pituitary glands to release a range of hormones that affect every part of our body in one way or another. As I mentioned earlier in this article, the main players are adrenaline and cortisol and these exert their influence via the cardiovascular system and other organs. Adrenaline causes the heart to beat faster and blood pressure to rise; this allows oxygenated blood to flow to areas of the body that are responsible to reacting to the source of anger. Traditionally, the areas needing the extra energy would be the limbs, to run or fight, and the brain to think faster, whilst blood is diverted from other less important areas line the stomach. Extra energy is also provided by the release of extra sugar or glucose into the blood. The effect of all this hormonal activity is a rapid heartbeat, breathlessness, as the lungs struggle to take in more oxygen, high blood pressure and a raised body temperature, due to increasing energy expenditure. Physically, mentally and emotionally it pays to check your anger levels and do something about it. I will continue next week with Part 2 and what to do about your tantrums. In the meantime, instead of reaching for the bottle of alcohol or some dope or prescription drugs, why not try some Gaba, which is an essential amino acid and a great supplement to help your high anxiety levels and to help you sleep at night. I would suggest helping yourself cope with the rigours of living by looking at supplementing your diet with another non-essential amino acid like Tyrosine Mood Food. Tyrosine Pure Mood Food is necessary for the manufacture of dopamine and noradrenaline, which are required for concentration, alertness, memory and a happy, stable mood. If you have an angry outburst, go and take some Tyrosine to help calm you down, boost your concentration and clear your foggy brain. Adrenal Plus Support. If you support the function of your adrenal glands, you have more chance coping with the everyday pressures of life. Many people suffer with morning fatigue and depression due to sluggish function of the adrenal glands. The adrenal glands are 2 small glands that are situated just above the kidneys and when they are working efficiently, they produce extra surges of energizing hormones such as cortisol, adrenalin and DHEA to help you face the challenges of the new day. In other words, the adrenal gland hormones increase your resistance to stress and provide the drive and energy to succeed. Magnesium, the Great Relaxer, can be taken before bed to assist with a deep and restful sleep and helps to reduce stress.